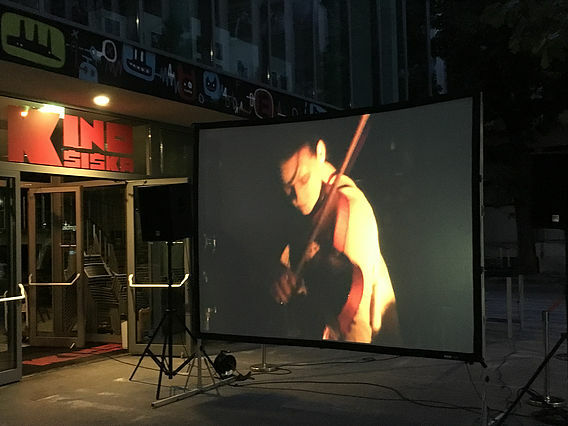 Echoes from invisible landscapes was presented at Sajeta Festival in Tolmin, Slovenia, in July 2016. Javorca – Resurrection, the audio-visual performance by Bratko Bibič will happen in the memorial church of Holy Spirit in Javorca on Sunday, 17. July 2016 at 21:00. The event is part of the international project Echoes from Invisible Landscapes. The artwork will be broadcasted live on the website www.javorca.com, but you can also experience the event at one of the projection sites, where the performance will be screened on the big screen: Creative Camp Sajeta (Sotočje-Tolmin), Center of Urban Culture Kino Šiška (Ljubljana), Last Museum of Contemporary Art (Logje), Village center (Labor), Trg Zmage (Piazza Vittoria) /Corte Bombi (Gorizia), RAJ-Badgasse 7 - Celovec (Klagenfurt), Trg pr'Špini (Izola). The artwork was done in cooperation with many musicians and visual artists from different parts of Europe: Austria, Portugal, Serbia and Slovenia. The event in Javorca will bring together artists from the wide spectrum of genres and with the background in traditional and experimental artistic methods. They will commemorate and rearticulate the theme of the First World War. They present it as the Great War, which ends all wars. At the same time, they use the motives of the Isonzo Front and its south-eastern part of the valley, the memorial church of the Holy Spirit and the canyon of the river Tolminka. Viewers will be encouraged to explore the issue of war in the modern era as "the height of civilization" and are invited to celebrate our wonderful Tolmin Valley. The instrumental concert with vocal pieces, composed and performed by Paul Schubert, Samo Kutin, Jelena Popržan, Ana Kravanja, Vid Drašler and the local vocal group Javorca, will be performed and filmed in the church of Holy Spirit In Javorca (Polog-Tolmin), with previously recorded, compiled, designed and animated visuals created by Eduardo Raon, Miroslav Sretenović aka Izvanredni Bob and Mark A. Kovačič. The experience of audio-visual performance will only be possible via the internet.